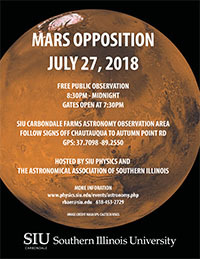 CARBONDALE, Ill. – Sky gazers will have a great opportunity to see our celestial neighbor Mars this month during a special observation event hosted at Southern Illinois University Carbondale. The Mars Opposition viewing event is set for 8:30 p.m. to midnight on July 27 at the SIU farms astronomy observation area west of the campus. The event, hosted by SIU’s Department of Physics and the Astronomical Association of Southern Illinois, is free and open to the public. Bob Baer, specialist with SIU’s physics department, said the event is special for amateur astronomers and stargazers because it provides an opportunity to see Mars while it is close to the Earth and bright. The orbits of Mars and Earth line up every two years and, depending on the orbit eccentricity, the distance between the planets can vary. Though Mars goes through opposition every two years, it has not been this close since 2003. Observers also will be able to see Jupiter, Saturn, the moon, and Venus during the event, as well as some deep sky objects, Baer said. During clear sky conditions, the SIU farms astronomy observation area can be significantly darker than campus and the community, allowing observers to view dimmer objects. Organizers will have several telescopes set up on telescope pads. “The observation will have more of a star party feel to it,” Baer said, adding that the university partners with the AASI as a community service. “The events let people observe the planets and stars first hand, which can be quite a different experience than one gets from simulations or virtual experiences,” he said.